In a new report titled “Ventilation Equipment Market: Global Industry Analysis and Forecast 2017 – 2025,” the analysts of Persistence Market Research present a clear picture of the various market trends and opportunities in the global ventilation equipment market. After a thorough inspection of the market, the analysts have observed that as there is remarkable rise in the ‘Manufacturing Value Added’ (growth rate of the market in percentage) in developing countries, the ventilation equipment market is expected to account for around two-thirds of the total value share by the end of 2025. 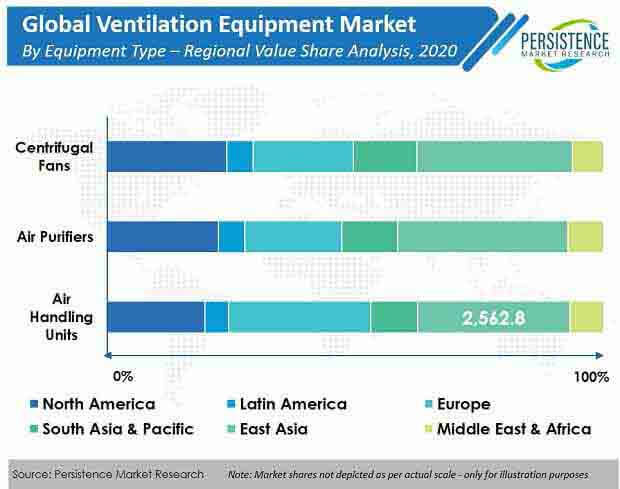 The analysts have further noted that ventilation equipment manufacturers are focusing on strengthening partnerships with IP solution providers to incorporate advanced technology in ventilation equipment and to diversify their product portfolio in accordance with future market demand. New entrants in this market are likely to divert their focus on revolutionary technology to take lead in evolving the modification of ventilation equipment. Besides, the focus has also been shifted to capacity expansion and commercialization of ventilation equipment in emerging economies. The key players in the global ventilation equipment market are amplifying their sales network in overseas countries through collaborations with key market distributors. Their main strategy is the integration of innovative technology to improve the efficiency of ventilation equipment and this is expected to be a potential market trend. While studying the country-wise trends of the market, the analysts have observed that China is expected to witness substantial monetary growth. Among all the countries, sales of ventilation equipment in China is expected to increase at the highest CAGR in terms of value. While India is expected to witness good growth in the ventilation equipment market given the rapid industrialization in the sub-continent. The key part of this report is Persistence Market Research’s analysis and recommendations on the global ventilation equipment market. The report provides an overview of the global ventilation equipment market performance and underlines factors influencing the growth of the market. The analysts have also provided key strategic recommendations for both existing and new players in the market to emerge sustainably profitable. Sales of ventilation equipment are tracked on an annual basis depending upon the electricity consumption across applications at a country level. Decline or increase in prices over the forecast period is based on historic market trends and is kept linear across countries. A general market scenario is assumed for ventilation equipment sales and driving factors are assumed to develop the market forecast. The report covers the competitive landscape that provides a dashboard view of companies that manufacture and provide services in the global ventilation equipment market. The report also profiles some of the key players and outlines strategies such as mergers and acquisitions along with companies’ expansion plans across various regions. The analysts at Persistence Market Research have performed systematic and exhaustive secondary research to acquire the required data points to arrive at the overall market numbers. The research process begins by listing key market players across the value chain including technology developers, manufacturers, and distributors. In-depth questionnaires have been developed for each node in the value chain to extract the required market information through primary research interviews. The data thus acquired is validated using the triangulation method, wherein secondary and primary research data along with Persistence Market Research analysis contribute to the final data. For a better understanding of the market, the data is represented using charts, infographics, and through the presentation of key findings by region to provide actionable insights for informed decision making. Marketing is an important function in the sales of ventilation equipment across the globe. However, exaggerated marketing by new entrants has led to confusion among consumers. In their zeal to attract more customers, market players provide a number of options, sizes and prices of various ventilation equipment. This tends to mislead consumers to buy the advertised products. This strategy of aggressive and over-the-top marketing is likely to spread mistrust among consumers and restrain the growth of ventilation equipment, especially in developing countries where lack of product awareness and the inherent benefits already persists in the market. Stagnant installation of ventilation equipment is another reason that is expected to hamper the growth of the equipment segment during the period of forecast. The air quality and associated standards in developing regions such as China, India, Middle East, etc. have tainted to alarming levels. Also, the penetration of ventilation equipment and other air treatment products in the market is low in developing countries as compared to the developed regions of the world. The ventilation equipment market in developing countries such as India has grown over the last few years, albeit not at the required pace. Major consumers of these products are industries, institutions, offices, and other commercial spaces. Low adoption of ventilation equipment is mainly attributed to a lack of awareness among consumers and high initial cost of the products. The recovery in Manufacturing Value Added at the global level is pulling in significant capital investment across different industries. With the general growth rate of various industrial sectors such as chemicals and pharmaceuticals reaching higher rates of growth, new capacity additions for various downstream products are expected to come up over the coming years. As the use of ventilation equipment and different air treatment products is necessary among the manufacturing industries, it is expected to accelerate the market growth of ventilation equipment over the forecast period. Further, increasing urbanization and infrastructural development in emerging economies such as China, India, Philippines, Nigeria, Indonesia, etc. have led to an increase in total spending on dynamic infrastructural sectors such as power, water, and transport. In addition to this, the shift in global economic power from west to east is boosting urbanization in most of these countries. The overall economic growth, coupled with prompt urbanization and changing global demographics is expected to create good demand for ventilation equipment inter alia other industrial and commercial products to support the overall target growth across regions. The market for centrifugal fans is estimated to be valued at more than US$ 4,000 Mn by 2017 end and is projected to represent an incremental $ opportunity of more than US$ 2,000 Mn between 2017 and 2025. The centrifugal fans segment is projected to account for a little more than 15% value share of the global ventilation equipment market by 2025 end. The market for the air purifier segment is slated to be valued at more than US$ 1,000 Mn by 2025, expanding at a CAGR of 5.5% over the projected period. Zibo Lihua Ventilation Equipment Co. Ltd.
Systemair AB, Totech Corporation Inc.
Kruger Ventilation Industries Pte Ltd.